Glaucoma affects over four million people in the United States. It is the most common cause of vision loss in persons of African-American descent and a leading cause of blindness in the U.S. In the U.S. and other developed countries, rates of glaucoma are rising as the population ages. Glaucoma damages the eye’s optic nerve. It usually happens when the fluid pressure inside the eyes slowly rises, damaging the optic nerve. Often there are no symptoms at first, but a comprehensive eye exam can detect it. More effective long-term treatment options are needed. Seventeen-year-old Emily Mallette is a typical teen-ager. She worries about what to wear. She studies hard. She wonders where she’ll go to college and what she’ll be when she grows up. “It’s fun to think about the possibilities,” said the straight-A student, a junior at Lee’s Summit North High School. Medical research is the reason those possibilities exist for Emily. State-of-the-art glaucoma treatments through Sabates Eye Centers and the Vision Research Center at the University of Missouri-Kansas City, part of the School of Medicine’s Department of Ophthalmology, have preserved her limited and fragile eyesight. Emily’s life was always atypical, even before her diagnosis. By only seconds, Emily was born the oldest of triplets. Three identical girls. Jodi did not undergo fertility treatments and started calling her daughters miracles when she discovered she was pregnant with triplets. She snaps photos of her smiling girls growing up in birth order: Emily, Morgan, Abigail. 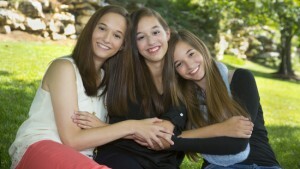 The triplets were 8 when Jodi found out Emily failed her vision test at a school health fair. She had started holding books closer to her eyes. “We’ll get you some cute purple eyeglasses – your favorite color,” Jodi told her daughter. Jodi had started wearing glasses in third grade, so it didn’t seem like any big deal. But Emily’s diagnosis was much different than they imagined. Glaucoma results in optic nerve damage caused by abnormally high but painless pressure inside the eye. The condition is a leading cause of blindness in the U.S. About 2.2 million Americans have glaucoma but only half know they have it. Everyone from birth through their senior years is at risk for glaucoma but some more than others. People older than 60 are six times more likely to get glaucoma. And glaucoma is six to eight times more common in African Americans than Caucasians. Because nearly one out of every four Jackson County residents is African American, the population is at higher risk for glaucoma than most other parts of Missouri and many other areas in the U.S. There is no cure — yet — for glaucoma and vision lost cannot be regained. With medication and/or surgery, it is possible to halt further loss of vision. That’s why Emily’s family advocates that people regularly get their eyes tested. Nelson Sabates, professor and chair of the UMKC Department of Ophthalmology and founder of its Vision Research Center, and his team of researchers are working to find better treatments and potential cures for eye diseases. Childhood glaucoma is rare; about one of every 10,000 babies born have the condition. Signs include unusually large eyes with cloudiness and excessive tears as well as light sensitivity. But sometimes there aren’t apparent symptoms. Glaucoma can damage vision so gradually that you might not notice any vision loss until the disease is at an advanced stage. That’s what happened to Emily. They don’t know the cause. Emily underwent eight surgeries, missing out on swimming during summers because she had to be careful to avoid an eye infection. She began learning braille, but to master it, she’d have to learn blindfolded. Jodi watches Emily in awe. She makes great grades by working harder than her peers, leaving her tired. What takes Morgan and Abigail 90 minutes to read takes Emily four hours. Emily has 20/400 vision in one eye that detects only light and shadows, and 20/50 in the other, although it’s a narrow field of vision. For the past three years, Emily’s eyesight has remained the same. She credits advances in research like the glaucoma tube shunts she has that reduce inner eye pressure and the damage it causes to the optic nerves by draining excess fluid. She uses eye drops. She also credits her doctor, Rohit Krishna, of the Vision Research Center at UMKC and Sabates Eye Centers. Specializing in the diagnosis and management of glaucoma, including the use of tube shunts like Emily’s, Krishna keeps the family informed about the latest in technology and research. Under development at the Vision Research Center at UMKC are potential drugs that target cells affected by the disease and replace absent growth factors that support the health of the retina—the part of the eye that is used to see clearly. In addition, Vision Research Center researchers are developing a new drug-delivery approach for established glaucoma drugs that would eliminate the need for daily eye drops. They also are testing a promising approach to treat the inflammatory component of glaucoma. So grateful for the vision she does have, Emily and her sisters created an organization to raise money for glaucoma research. “Never Lose Sight” is printed on T-shirts and green bracelets. The sisters also launched a “Never Lose Sight” Facebook page that has information about glaucoma and Emily’s journey. “It’s cool that something we care about and launched at a little sleepover has taken off,” Morgan said. “This cause is bigger than just our family,” Abigail said. The results so far: a $1,000 check delivered to Krishna for glaucoma research at UMKC. And a future full of hope for Emily and other glaucoma patients across the community.